For Sylvia, being an artist is not only about singing. It’s also about listening deeply: to herself, to others, and to the stories that want to be told. That’s what first led her to discover her love of music as a child and, subsequently, to enjoy more than two decades of a successful and multifaceted career as a singer and songwriter. But listening is also what brought Sylvia to a crossroads more than 14 years ago, when she heard a new call. While profoundly grateful for the chance she had in her young adulthood to see the world from the jump seat of a tour bus, she began to crave other experiences and, in particular, opportunities to help others. She answered this call by becoming a certified life and career coach through the Hudson Institute of Santa Barbara, California in 2002. Since then, she has coached business executives, artists of all genres, small business owners, individuals, and non-profit organizations to make the same type of productive self-discovery that provides positive momentum as they develop both personally and professionally. For nine years, she also served on the board of a non-profit organization that serves and supports the chronically mentally ill. She never stopped singing during this time – keeping a weekly appointment with her voice teacher and continuing to participate in benefit concerts – but she made a conscious choice to pivot away from music and pursue new and different contexts in which to cultivate her long-held personal values of compassion, curiosity, and non-judgment. Yet throughout this time, Sylvia never stopped evolving and engaging in her own process of self-discovery as an artist. As a result, this fall she will release It’s All in the Family, her first album in 14 years and the first ever on which she is a co-writer on the majority of songs. Although at one time Sylvia might have classified her years away from music as a detour, today she views them as vital steps on her journey – steps that have allowed her to reemerge as a more complete, more conscious artist than ever before. This viewpoint directly informs It’s All in the Family, and she is eager to share it with new listeners as well as her long-time fans who have grown along with her. It’s All in the Family is brimming with songs that evoke precise places, times, and emotions. Whether it’s the clawhammer banjo and old-time music influence on the opening track, “Every Time a Train Goes By,” or the Irish tin whistle and strong imagery on “Immigrant Shoes,” listeners are invited into dozens of specific, formative, and intimate moments in the lives of Sylvia and her family. But like all great stories, It’s All in the Family doesn’t feel limited to the bounds of its particular characters, images, and events. Each song touches and builds on a collection of themes that connects the listener with that which is universal. Similarly, just as Sylvia speaks from many different perspectives and with many different voices from track to track – yet ultimately delivers an album with strong, resounding lyrical themes – a range of musical styles produces a cohesive sound that defies neat categorization. The collaborations on the album – between co-producers Sylvia and John Mock, between co-writers, and between the cadre of other exceptional musicians featured on each track – truly feel organic, with distinct influences of folk, country, bluegrass, classical, and Irish music coming together naturally to produce something that feels both new and deeply rooted in tradition. Perhaps the most pervasive lyrical theme on the album is that of family. 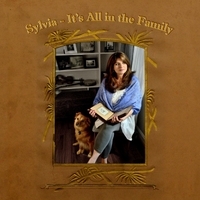 On the title track, “All in the Family,” one of four songs co-written with John Mock and Thom Schuyler, Sylvia illuminates both the positive and painful ways we are bound to family with a series of simple yet striking images: a wedding dress worn by three generations, a family recipe handed down, a mother protecting her children from hardship, a family member lost too soon to alcoholism. On “Somebody’s Daughter,” she offers a gentle but compelling reminder that the tenderness we feel for those we love most is neither illusion nor weakness; the ties of love that bind us to our parents and our children are real, and are in fact the very same ones that connect us to our broader human family. On “Cumberland Rose” and “Hope’s Too Hard,” two songs specifically selected by Sylvia for the album because of their resonance with its themes, she explores another ubiquitous facet of the human experience – the inevitability of loss and grief and the question of how to face them. While the album doesn’t offer a clear-cut, facile answer, it consistently bears witness to the transformative power of acknowledging our wounds, facing our fears, and accepting our past. Sylvia shows that surrendering to what is beyond our control is not the same thing as giving up – it takes profound courage and strength, and it’s necessary in order to realize new possibilities. As Sylvia recounts these moving stories that span generations, the interplay between the past, present, and future emerges as another strong motif. Sylvia fully acknowledges the irrevocable influence of the past; “Grandpa Kirby Runnin’ the Hounds” features her grandfather’s actual fiddle and banjo in a warm callback to the barn dances he played at in the early 1900s. But at the same time that she honors her roots, she boldly celebrates the beauty of the present and potential of the future. In “Leave the Past in the Past” and “I Didn’t Know What I Was Missing,” two of four collaborations with Bobby Tomberlin, she offers metaphors that illustrate what it would look like to physically overcome that which holds us back. Whether it’s clearing all the chairs from the kitchen to make room to dance or climbing a mountain to gain a new perspective from the top, through these songs we experience what it feels like not to regret or dismiss the past, but to let it go in order to make room for what is coming next. In several songs, including the powerful closing track “Do Not Cry for Me,” Sylvia embodies the voice of someone who is looking back with a deep sense of peace, gratitude, and all-encompassing love that will transcend time. Throughout It’s All in the Family, Sylvia touches on the choices, challenges, and turns in the road that have brought her to where she stands today and delivers her most personal material to date, combining her skill as a vocalist with her heart as a storyteller. In exploring her relationship with the past and the passage of time, Sylvia speaks directly to listeners who might themselves be considering a new start. Rejecting conventional binaries about youth, age, and their bearings on one’s creativity and relevance, Sylvia celebrates her experience and unapologetically owns her voice as a seasoned artist. In doing so, she welcomes listeners to live fully in the present moment – embracing all the possibilities it holds – without discarding the past, seamlessly weaving her current music in with the sounds and songs of her early career. As a performer, she still enjoys singing her hits like “Nobody,” “Tumbleweed,” and “Drifter,” but she brings to them a presence and perspective that infuses them with new life, reminding fans why they first fell in love with her music while also allowing them to experience it anew. Oh my goodness! There really are no words to describe how grateful I am to FINALLY have a NEW Sylvia album!!! My CD's arrived from Sylvia to coincide perfectly with the actual October 7th release date. Her beautiful singing and the nice layout and design of the CD cover are all things I've been thinking about and wanting for such a long, long time. I just ordered a few more to give for gifts. The way I like to describe what it's like for me to anticipate a new Sylvia album. For example... I compare it to when I saw (on the news last December) all those extremely enthusiastic "Star Wars" fans waiting in line for days and days to see the movie. Many wearing costumes, sort of like when I'd wear my specially self designed t-shirt with Sylvia's name and picture on it. I appreciate their excitement and understand how important it is to have those things that bring such happiness, fun and fulfillment to our lives. For me, there's nothing that can help brighten things up more than the anticipation of a NEW Sylvia album. It was like that when I was a teenager, and it's even more so like that for me now. It was nearly a year ago when I was feeling so sad, down, frustrated and like there wasn't any hope. Which had a lot to do with my birthday and upcoming holidays without my dear mom. She was always so excited about things like that and it was so hard for me to cope with missing her so much. I did a search online and found that Sylvia had hosted "The Midnight Jamboree" in Nashville. As I listened my way through the show, Sylvia talked about a new album that she was in the process of recording in the studio, and she introduced a new song entitled "Hope's Too Hard" (written by Kate Campbell). Oh, I absolutely love this song! I know mom would really LOVE it, too!!! Sylvia sings it with so much feeling as she does all of her songs. But this particular song was so timely with what all I had been thinking about and feeling, and getting to hear Sylvia sing it was just what I needed. It was healing for me, not only getting to hear her sing a new song, but one that touched me so deeply. This new album was and is a much needed spirit-lifter. It gave me something exciting to look forward to these past several months. Another song she sang on that show from this amazingly wonderful album was, "All in the Family" (the title track) . What an excellent idea for a song! When I listen to it, I can just picture a few short years before my grandma passed away, when she and my cousin Jan were going through old pictures together with grandma pointing out who everyone is in each faded and old picture - Along with fascinating stories that only grandma could tell, having been there and lived in those times so long, long ago. I remember as a kid what a thrill it was to go through old pictures with grandma. I remember her hanging clothes out on the clothes line back then too. I know she and mom would absolutely love the song, "All in the Family". I think about them and all the wonderful memories as I listen to the words with Sylvia's pure, sweet voice singing so beautifully, touching me so deep down in my heart and soul. "I Didn't Know What I Was Missing". This is exactly the production style that I've been missing and thirsting so much for the past thirty years from Sylvia!!! Every song on this album helps quench that thirst. But I think this is an extraordinary track that I wish could be released as a single and music video. On our many, many trips to see Sylvia in Jackpot, Nevada, during her performance(s), sometimes she would tell a story about the train that passed by her trailer when she was a little girl. It's so neat that she co-wrote a song about it, "Every Time a Train Goes By" is another excellent song and even more special for me having heard her tell that story from her childhood. I was able to hear the song played during a couple different radio interviews that Sylvia did the past few weeks. Sort of reminding me of how it was back in the day when I'd be able to buy the 45 rpm single a few weeks before the album gets released. Those were exciting times, but this is even more exciting!! A perfect example of that is another one my favorite songs on this album, "Here Lately" with the great line... "Life is like a dream and I'm a kid again". Which is exactly how I feel when I'm listening to this album. It brings back so many memories of the times I'd buy Sylvia's albums when I was a kid and the excitement it brought to my life back then, and even more so now. "Leave the Past in the Past" is another awesome song! Although, I can't ever seem to do what the title is suggesting. I think about the past a lot, perhaps too much. I especially like the line... "And who knows what we might find, if we surrender heart and mind". Wow! I love it! I've been thinking a lot about and hoping that Sylvia's booking agency can get her booked on the "Ellen" show. Ellen always closes her show with "be kind to one another" and I think she would really like Sylvia's song, "Somebody's Daughter". Which contains the heartfelt line... "so be kind to everybody's daughter and everybody's son". "Immigrant Shoes" is a fun, up-beat track that very much adds to the greatness of this album. It's a really fun tune to sing-along on. "Do Not Cry For Me" is very close to my heart. It reminds me of how my mom wanted things as she was leaving this earth. I miss her more than ever. She used to sometimes call me "darlin'", so that just adds to it and makes the connection I have to this song even stronger. My precious mom passed away peacefully at my little brother's place in Seattle. She didn't want a funeral where people would publicly cry for her. So just a few of us had a gathering where we brought our favorite pictures and shared our memories of mom. She wrote her own obituary and sent it to one of her friends a few months before she passed away. I didn't know she had done that until the night of her passing when I read it for the first time. Mom's love and sense of humor came though as if she was right here talking to me. It was extremely sad, but at the same time I was comforted by what she wrote. The same way I'm comforted by Sylvia's sweet words and singing. It's amazing Sylvia always seems to know what I need to hear for the healing process. I love this beautiful song so very much!!! For so many years I've been wishing and hoping that Sylvia would decide to record a new album. I feel my dream was granted and I'm forever grateful that she put the focus back on her music career and recorded this much-anticipated, spectacular NEW album!!! A very sincere thanks to John Mock, Bobby Tomberlin, Thom Schuyler, Craig Bickhardt and all of the other magnificent songwriters and musicians that contributed and helped create this album for everybody to hear and enjoy!!! greater than the sum of its parts. Although each song tells a story and stands tall on its own, the overall journey, from opening track to closing, should not be missed. The lead track, “Every Time a Train Goes By,” tells the story of a young Sylvia who finally embraces her fear, stands her ground, and faces the menacing machinery that rolls past her home. With the smile and wave of the train conductor as inspiration, she transforms that fear into a strength that she carries forward. It is this same sense of strength that closes out the disc on the song, “Do Not Cry For Me.” This is the song of a woman facing the end of her life, accepting that her work on Earth is done, and encouraging those left behind to take comfort, knowing that the end of life is not the end of the love they share. This CD is the most personal we have heard from Sylvia to date. Each song is a moment of life, captured and preserved. And while these are Sylvia’s moments, memories, and feelings, they also belong to each of us because of the universality of family, strength, and hope.